Outer joins are used when you want the records on the one side of a one-to-many relationship to be included in the query result, regardless of whether there are matching records in the table on the many side. With a Customers table and an Orders table, for example, users often want to include only customers with orders in the query output. An inner join (the default join type) does this. In other situations, users want all customers to be included in the query result, regardless of whether they have orders. This is when an outer join is necessary. Double-click the line joining the tables in the query grid. The Join Properties window appears (see Figure 1). Select the type of join you want to create. To create an outer join between the tables, select Option 2 or Option 3. 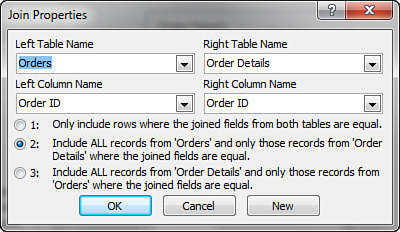 Notice in Figure 1 that the description is Include All Records from Orders and Only Those Records from Order Details Where the Joined Fields Are Equal. Figure 1. Establishing a left outer join. Click OK to accept the join. An outer join should be established between the tables. Notice that the line joining the two tables now has an arrow pointing to the many side of the join. You can use an outer join to identify all the records on the one side of a join that don’t have any corresponding records on the many side. To do this, simply enter Is Null as the criteria for any required field on the many side of the join. A common solution is to place the criteria on the foreign key field. 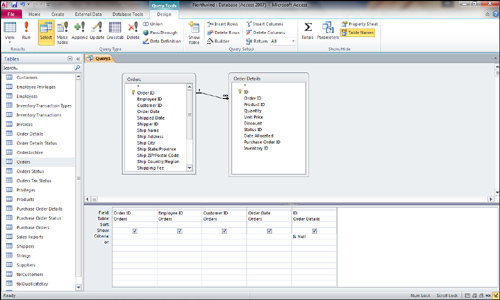 In the query shown in Figure 2, only customers without orders are displayed in the query result. Figure 2. A query showing orders without order details.